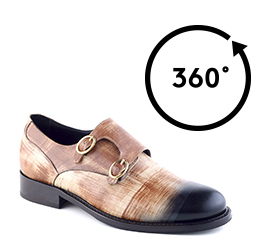 Exclusive elevator double-buckle shoes by Guidomaggi, characterized by the distinctive color of the upper, obtained through the "Patina" technique. A sophisticated crafting process which plays on the design, contrast and colours of the leather, giving manually fade and shades of tone to the original color of the upper in full grain leather. The result is a unique aged effect that enhances the black texture on the toe, the shades of beige and dark brown on the leather, brightening up their natural shine. Maximum refinement for those who love craftsmanship and handmade shoes and look for unique and shimmering reflections.